With Her Maj down the road at Bury St Edmunds meting out the Maundy Money, time once again to invoke a fine tradition dating back one full year (come in Kesgrave Kitchen): let's head out on the Thursday before Good Friday. Bit of a brainwave to touch neither the A14 nor A12 and instead take the Felixstowe Road, passing the back route to the Orwell Crossing and the Suffolk showground (oops, Trinity Park) to a well known orange branded superstore. Salute big Sainsbury's at Warren Heath. Quality start with an absolutely prime parking spot outside the main entrance, the one you never ever get. 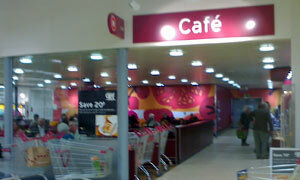 For years, there was an OK cafe stuck on the far right hand side, almost part of the overspill area. Like an ageing film star, this place has had a lot of work done in the last couple of years and has re-emerged, well, larger. Cafe 2.0 is nicely curved & refurbed, mixing comfy sofas with more practical tables. Chiller has a decent range of J2Os and other soft drinks, much unlike The Garland. You queue, you read the overhead boards, you order, you find a seat. Food appears to be freshly prepared and, unlike certain other every-little-helps places, hasn't been sitting around for hours. Caloried up, my receipt informs me that "Using a Nectar card today you would have earned 10 points". Ain't life full of regrets. Up I get to requeue for dessert. Needing to balance those scales a tad, mine's the breakfast muffin with oats, cranberries, and other forest floor foodstuffs. Coffee? Of course! Surprised to see it listed, that'll be a double macchiato, please, nice lady. Wait there while I make it, she says, so I freeze and observe proceedings. All looks good. And by golly, it is good, really good, very very good indeed. Her skill? Expensive machine? Who knows or cares? Top cuppa java, to be sure, and an unexpectedly pleasant experience all round. If it was a car -- Renault Grand Scenic. If they were passing by -- Victoria Wood.